A table in todays's Sport magazine compares indoor sports by the calories they burn off in an hour. Squash is the top indoor sport for burning calories, with 816 burned per hour (assuming a body weight of 150 lbs) - the stats are actually taken from the health/exercise website http://caloriecount.about.com . The Super Series finals move to their new home of Queen's Club next month (a good idea? Vote over to the right!). As a preview to the event, enjoy this fine rally between those great rivals Nicol and Power at Broadgate in 2003. Power eventually took the title 15-11, 10-15, 13-15, 15-4, 15-14. We've been reporting the alarming rate at which public squash courts are disappearing in the UK for a couple of years now - click on provision, above. So it's encouraging to see that the Daily Telegraph have taken up the baton to try and bring national coverage to this decline, as part of its rejuvenated squash coverage. Its new campaign to save community sporting facilities in the UK is supported by Gordon Kerr, board director of England Squash. Kerr has started his own 'threats database' after being concerned at the number of clubs diminishing in north London alone (which has been followed closely here on squashblog). The campaign is also backed by Tim Lamb, chief executive of the Central Council for Physical Recreation (CCPR), the independent voice for governing and representative bodies in sport, and Hugh Robertson, Shadow Minister for Sport. "local authorities should ensure that provision is made for local sports and recreation facilities (either through an increase in the number of facilities or through improvements to existing facilities) where planning provision is granted for new developments (especially housing)." Campaigners fear that this provision is being ignored, leading to open spaces, sports and recreation being threatened by diminishing built sports facilities. Squashblog has particularly followed the redevelopment plans for the Sobell and Finsbury leisure centres in Islington, which are under threat. "It is pathetic. It is all money-driven and unfortunately sports facilities are not as viable as a block of flats." I'm going to post my own article on Lee Beachill's retirement very soon. Right: Did any player hold the ball better? squashblog poll: Do you agree with the change of Super Series venue? Next month the Super Series finals are to move to a new home at the Queen's Club in West London. The Finals have mostly been held in recent years at Broadgate Arena behind Liverpool Street station in the City. Since the arrival of ATCO boss Ziad Al-Turki as the Chairman of the PSA board, the men's tour has been looking for increasingly prestigious venues to boost its profile. The Queen's Club is probably best know as the venue for the Stella Artois Tennis Championships which traditionally provide a grass court warm-up before Wimbledon. A good thing? Broadgate may have attracted passing City workers, but was it too small, too hidden away? Will Queen's Club bring better facilities for players and spectators and greater media attention to the event? Or might it suggest that squash is still the preserve of the private members' club? 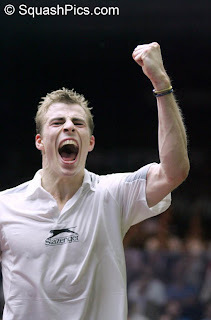 With recent success as runner-up in the Tournament of Champions in New York - and heavily fancied for the British Nationals next week - it's fair to say that Nick Matthew is the hottest Brit on the tour right now. It is testament to Matthew's strength that he has been able to hold a position in and around the top ten while sustaining injuries. With Lee Beachill apparently set to retire at the Nationals, the number of English players who are set to challenge Egyptian dominance at the top of the rankings this season will diminish, and when at the top of his game, few are better equipped than Matthew to lead the charge. Approaching the peak physical age for a squash players, there is a possibility - if he can keep fit and impose his own tempo on his opponents - that Nick may be able to enjoy a spell as the pre-eminent English player. His quarter final win over higher-ranked England teammate James Willstrop in New York will have been a psychological boost (as will have beating Ramy Ashour) prior to the Nationals, where the two Englishmen are seeded to meet in the semis. They have a warm-up tomorrow night, where they have drawn each other in the latter stages of the Swedish Open. Squashblog will not be in Manchester, but looks forward to watching Matthew in the final stages of the Canary Wharf Classic and Super Series finals in March.